Sales teams working well together is integral to the success of your business, a team who co-ordinates their actions and is driven to succeed will perform better than a disinterested, un-invested one. It is no secret that one of the best, non-financial, methods to improve sales staff motivation and co-ordination is to use team building activities. For more on leading sales teams, and keeping them motivated - see our content on managing sales teams. To prevent this, and to let people figure out their roles – and to solidify communal understanding of who best fits which role – team building is the best solution. Team building exercises let your sales staff figure among themselves who is most suited for what, increasing their efficiency and co-ordination in working environments. From a social perspective team building strengthens relationships, allowing people to confidently work alongside one another, and making them more invested in the team itself – driving them to strive for team success. More extroverted personalities may learn to tone their outgoing side down to suit the team’s needs, and more introverted characters may involve themselves more with the team as a result of bonding experiences. 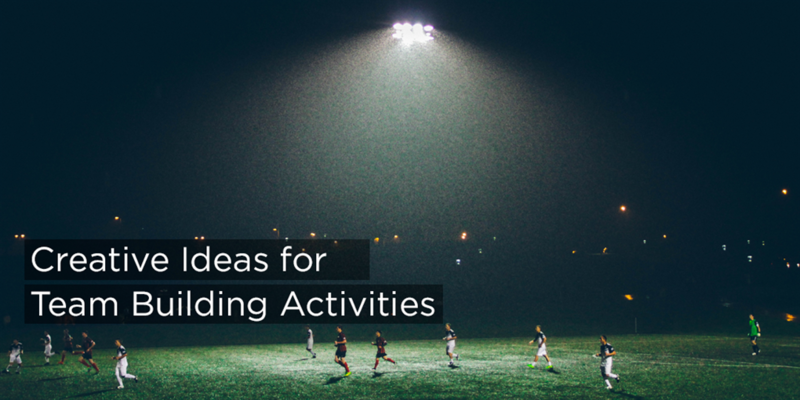 Here's some cool ideas for team building activities – focusing on social bonding, and also ones more purposed for defining roles and improving team co-ordination. Social team building is incredibly valuable when it comes to making team members feel like they belong within a distinct social group. Those who feel they are on the fringe of the group, or not a member at all, may suffer poor communication or a lack of communication. Having your team spend social time together gives them a sense of belonging and improves interpersonal relations. A day out to a theme park gets (almost) everyone excited - the communal sense of aniticipation and fear, and the shared experience of an adrenaline rush is something everyone can relate to. An exciting day out at a theme park gets everyone on the same level, with a central focus that all can enjoy without needing to belong to any specific social group or personality type. Theme parks can be a great way to create fond and humurous memories for your sales team to share and fondly recall. Be careful, you need to make sure that rollercoasters are something your whole team will enjoy - if anyone has an aversion to them it isolates them and can have a negative effect. Adventure days out to high-rope obstacle courses, such as Go-Ape!, are brilliant for getting your team to learn to work and play together. High-ropes provide a chance for laughter, and fun, as well as offering some space for help and teamwork as your staff help eachother tackle obstacles. It's a unique and memorable experience that will undoubtedly improve staff relations - but again, as with theme parks, make sure it is something your whole team will enjoy. The traditional work social, getting everyone down to a pub, or two, or three, to spend some time chatting and having a few (too many) drinks. In today's modern environment this may feel antiquated, with many preferring trendy bars or coffee shops - but sometimes a good old fashioned pub crawl can be a great way to get everyone to unwind and feel comfortable with one another. Risks, obviously, include people getting to drunk and doing/saying something they may regret - and many people don't drink, so ensure you won't be exlcuding anyone. A work meal can be a nice alternative, to get people out and socialising - as well as giving you all an excuse to eat some delicious grub. Bowling can work wonders, letting people chat in between turns as well as sparking friendly competition - often bringing introverts out of their shells. However, bowling can backfire - if people get too competitive it can sour the experience. Bowling can be a great alternative social team-building experience, but you should consider how members of your team will interact with one another - to prevent it ruining relationships. Social team-building is beneficial when it comes to bolstering relationships, but to better equip your team to perform well and in synchronisation with on another it is often more useful to use exercises which require team-work. In a team people need to perform their roles, so that tasks are completed properly and effectively - overlapping and competing team-members create mess and slow action. Team-building exercises help people fall into their natural roles, establishing hiearchy and how the team bests work together - it also means that any individuals who naturally try for specific team-roles (such as team-leader) negotiate tasks in a way that works. The experience gained in team building exercises becomes the foundation for future efforts, being called upon to illustrate who best performs where, and how the team can improve their co-ordination in business-world efforts. Fun-runs, marathons, endurance challenges, and sponsored hikes/treks/events are superb ways to strengthen a team's sense of unity, as well as raising money for a good cause. Take advice from us here at Aaron Wallis - we annually go on charity adventures and it's helped bring our team together through enduring the elements together, supporting eachother physically and emotionally. We've cycled the Coast to Coast Challenge, climbed Snowdonia, completed the Great Glen Kayak challenge and more! We can't recommend this enough! There are facilities that offer external team-building days out, with specifically designed courses which encourage your sales staff to perform well in their best-suited roles. The tasks these trips contain will require your staff to work together to solve problems, while having fun of course. These are the most direct way to have your team improve their efficiency in working together. Similar to the last two, camping takes your team out of the office, putting them into a situation where they can have a lot of fun, while also being forced to work together. All three of these require that your team nurse their problem-solving skills in a group setting. A more jovial and fun set of tasks; organising an office olympics and putting your sales staff into departmental teams means that they can all have a good laugh, while working together to beat other departments. The competitive nature of an office olympics means your staff will truly push themselves as a unit to come out on top - exactly how you would desire it in the real world. Whats more is this can be done on any budget, at any scale - with the challenges being as creative as you would like, as you get to design them! These are just a few team building ideas, the great thing about team building, and team bonding, exercises is that you can be creative with them - make them as fun or as regimented as you like - if you have any great ideas do let us know on Twitter or Facebook! Team building is a great way to motivate your team, but if you're looking for more ways to inspire your team - without breaking the bank, check out our alternative ways to motivate sales staff.